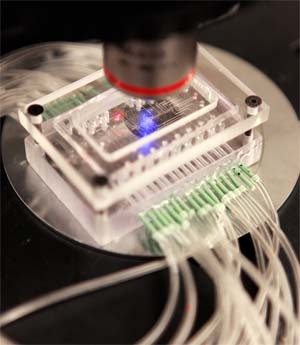 A programmable lab-on-a-chip (LOC) has been designed at Purdue University. Rather than going through a long and involved process to create single-use devices, researchers have succeeded in creating a much more versatile chip that can perform a wide variety of functions. LOCs are small and portable; they can be used in the field to perform real-time PCR, detecting and identifying bacteria, viruses and cancers. For example, rather than sending a blood sample to the CDC to test for swine flu, a field agent could make a determination once given the proper characteristics to program into the device. A Lab-on-a-chip (LOC) is a device that takes very small samples (as little as a pico liter) and performs a laboratory analysis. LOCs are small, ranging in size from a few square millimeters to a few square centimeters. The term "chip" is used because some of the manufacturing processes derive from those used to fabricate computer chips (integrated circuits). Photolithography techniques derived from semiconductor fabrication are used where needed. LOCs also require extremely small mechanical structures for fluid handling, like tiny capillary connections, mixers, valves pumps and dosing devices. Team member and doctoral student Han-Sheng Chuang, a student in the School of Mechanical Engineering, has led work to develop hardware for the new programmable chip, creating a single chip that contains a multipurpose arrangement of these components. The new chip is made out of a rubber-like polymer, called polydimethylsiloxane, instead of the rigid glass or silicon wafers often used. The flexible material is needed because pumps used to direct the flow of fluid operate with moving diaphragms. Most other chips have the polymer layer sandwiched between two glass layers. "We chose to build the whole chip out of the PDMS polymer, which makes it easier to fabricate and reduces cost over other alternatives, such as silicon or glass," Chuang said. The Purdue-designed chip is able to mix, store, heat and sense what the sample is made of, whereas previous programmable chips have been limited to mixing and storing samples. Programmable chips for in-the-field analysis are expected within the next five years. Readers of popular thriller-level science fiction may recall the Boink biosensor from The Cobra Event, a 1997 novel by Richard Preston, which was ultra-miniaturized - the size of a suitcase. From Purdue News via MedGadget.